Introducing the EdgeRouter from Ubiquiti Networks, part of the EdgeMAX platform. EdgeRouters combine carrier-class reliability with enterprise-level features in a compact and affordable unit. 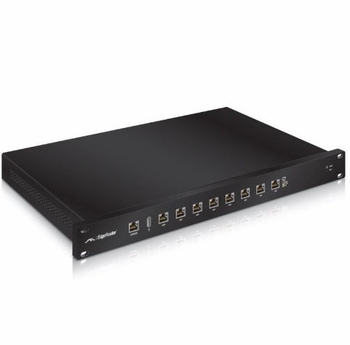 Available in a rackmountable form factor with eight functional ports, the EdgeRouter Pro and 8-Port EdgeRouter models are capable of routing up to 2 million+ packets per second. Powered by a proprietary and intuitive graphical interface, EdgeOS, EdgeRouters can easily be configured for routing, security, and management features required to efficiently run your network. For advanced network professionals, an integrated CLI is available for quick and direct access using familiar commands. Full-featured routing functionality for limitless applications. Next-generation user experience allows anyone to quickly become a routing expert.